Though many DC Comics fans have had trouble with what's happening on the movie side of things over at Warner Bros. following Batman V Superman: Dawn of Justice, The CW has really found a formula that seems to work. And they are doubling down for their 2016-2017 fall schedule. The network recently announced their full upcoming line-up for advertisers and media in New York City, and in addition to some brand new series, they also firmed up plans for their DC superheroes, which will now include Supergirl. To celebrate, The CW has put together a pretty great sizzle reel consisting of The Flash, Arrow, Legends of Tomorrow and of course, the latest newcomer, Supergirl. Melissa Benoist's Supergirl was on CBS for its first season, but rumors had been persisting for quite some time that the show could be making a move to The CW, which is owned by both CBS and Warner Bros. Last month, CBS left Supergirl out of their renewal plans and it was announced shortly thereafter that she would indeed be moving over to The CW for Supergirl Season 2, alongside her other comic book heroes. The move makes total sense from a business perspective. 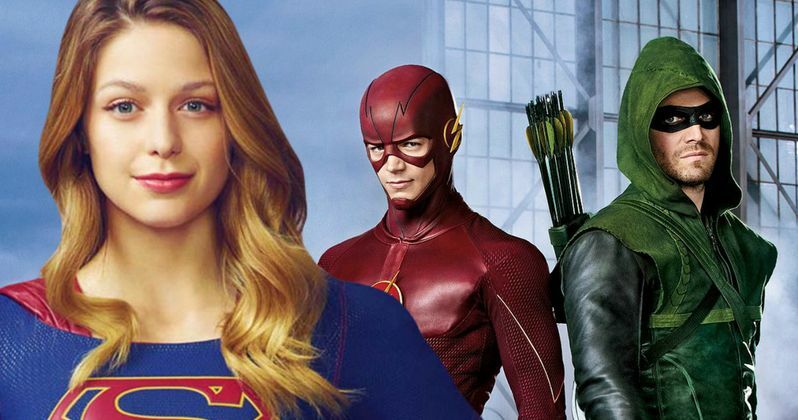 All of the shows are now being produced by the same network and one of the most successful episodes of last season was The Flash and Supergirl crossover. Now, not only will she be crossing over with Barry Allen next season, but the network announced that all four of their DC Comics TV series will be featured in one mega-crossover event. Supergirl had been doing fairly well over at CBS airing on Monday nights at 8 p.m., and The CW is keeping the show in that time slot for season 2. The Flash will be airing on Tuesdays at 8 p.m., followed by Arrow on Wednesdays at 8 p.m. and lastly, Legends of Tomorrow on Thursdays at 8 p.m. The network clearly has a lot of confidence in their comic book TV universe and they have a lot of fan support as well. Fans are still heavily vocal about the fact they would much rather see Grant Gustin take his version of The Flash to the big screen as opposed to Ezra Miller, who played the character briefly in Batman V Superman and will star in his own solo film in 2018. In addition to the minute long sizzle reel that showed clips from all four of the DC Comics shows that will be airing on the network next season, the network also releases a short 20 second video welcoming Supergirl to the network and making sure fans know she will be around for a second season, just on a new channel. This is the first time in history that a show that originated on CBS has moved to The CW, but it was a much better option for CBS than cancellation as a whole. And of course, for fans of the series. The show averaged more than 10 million viewers a week according to Nielsen during its first season and was the network's best performing new show last year. It also had the benefit of bringing in younger viewers to the network. Premiere dates for The CW's fall season have not yet been announced, but the network will start rolling out their new season premieres in October. The TV version of the DC Comics universe has a very different tone than the films appear to be taking, but fans are responding to it and next season will be a big opportunity for the network to further capitalize on the good faith they have built up with the fan base to this point. Are you excited about the Arrow, The FlashLegends of Tomorrow and Supergirl crossover next season?